Madge tells Charlene that she and Ray have split up. Lucy regains consciousness inside a drain and calls for help. But noone can hear her cries. Jim has arrived home and is very worried - it's not like Lucy to wander off. He's angry that Scott let Lucy go out. He goes to ring the police. Lucy is hunched up against the wall of the drain singing a nursery rhyme. She tearfully starts to call for help again. But noone comes. The water continues to run along the bottom of the drain. Scott is fed up that he has to be wasting time looking for Lucy when he has an exam tomorrow. Nikki and Scott see Mike and Jane and enlist their help to look for her. Jane sees the cat from the drain and just then Basil runs up. He runs off. They split up to keep searching. Basil sniffs the entrance of the drain. Jim is on the phone to the police. But they remember the last time Lucy ran away from home with Bradley and think she'll turn up soon enough. Ruth tells Jim that she upset Lucy because she told Lucy that she was going back to England. Jim is surprised to hear this and says they'll discuss it when they've found Lucy. Clive has got a flat tyre and asks Jim to borrow a jack. But Jim is just heading out to look for Lucy. 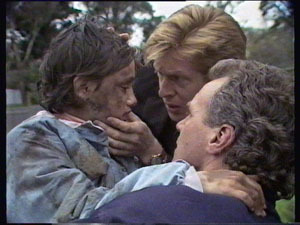 He explains the situation to Clive and he gets into Jim's car to help him with the search. Scott, Nikki, Jane and Mike meet up again, not having found Lucy. 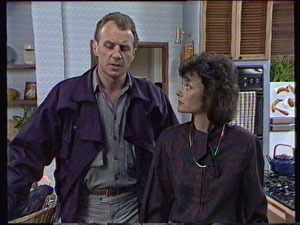 Jane tells Scott that he'd better take Basil home. Scott approaches the drain to drag Basil away, and hears Lucy shouting for help. He calls the others over. He doesn't know how they're going to get her out. Mike, Jane and Nikki are dangling Scott headfirst into the drain. He pulls Lucy up using his belt but they have trouble pulling her out. Jim and Clive arrive and assist them. LUCY: There's something wrong with my eyes! I can't see! Dad, I can't see! Everyone looks concerned as Clive looks at Lucy's eyes. Scott and Nikki come in very depressed and tell Ruth that Lucy is blind. Apparently Clive is examining Lucy round at his house. Scott blames himself for letting Lucy go in the first place. Lucy tells Jim and Clive how she fell into the drain. She says she hurt her head and when she woke up she couldn't see - she just thought it was dark in the drain though. Clive looks into Lucy's eyes but there's no reaction. 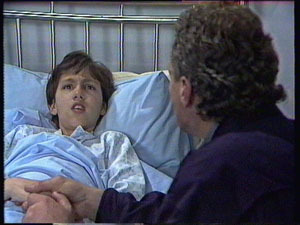 He tells Jim that there's no physical reason for Lucy's blindness that he can see, but they should take her to hospital for further tests. Jim frantically asks Clive what the chances are that Lucy could be blind forever. Clive says it's impossible to say - it could even be psychological. Jim is angry with himself for not staying home to look after Lucy when she was sick. Lucy tells Jim that she was scared in the drain - there were scratching noises and she was very scared. Scott is trying to study but is worried to death about Lucy. Jim comes in and tells them that her sight hasn't come back. Jim tells Scott that he blames him for sending Lucy out on her own - it was totally irresponsible. He also blames Ruth for leaving Lucy with Scott. Scott is worried about his English exam and Lucy's condition. Jim is off to Terri's funeral with Paul. Clive is showing Mike and Jane his relaxation technique. He makes them sit on the floor and breathe evenly with their eyes shut. He tells them to imagine they are running along the beach. Des is not impressed, but Mike and Jane get into it. He shows them a technique that they'll remember all their exam notes when they push their thumbs together! Mike and Jane are impressed and get up to go to the exam. Des has fallen asleep! Jim apologises to Ruth for being so hard on her the night before. He asks her not to go back to England just yet, but Ruth says that they need to clarify the situation between them. She says it's not enough for Jim to be fond of her, but Jim says that love could develop in time. Ruth isn't convinced, however. Jim and Mike meet Scott and Nikki on the road. Scott is stressed out about the exam. 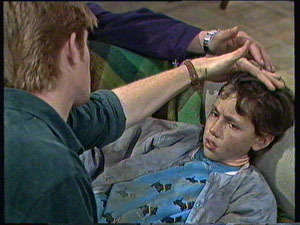 He can't concentrate because of the breakup with Charlene and Lucy's accident. He thinks he'll need a miracle to pass the exams.